Come and visit us at Hall 3.0, Stand D91: we look forward to meeting you! In Frankfurt we will have a completely new stand covering an area of more than 750m2 at a new location in Hall 3. Here the focus will be on major innovations setting the market future trends and which will have a profound impact on workshops' everyday life. Driver safety is essential for Valeo when developing products in Original Equipment and Aftermarket. To perfectly see and be seen on the road, Valeo invented smart lighting and wiping systems. Valeo is committed to limiting the environmental impact of its activities through a strong investment in Green innovation and production. 48V Hybrid vehicles, Stop-Start solutions and remanufacturing of starters, alternators, compressors and CV clutches are some illustrations of Valeo's achievements. 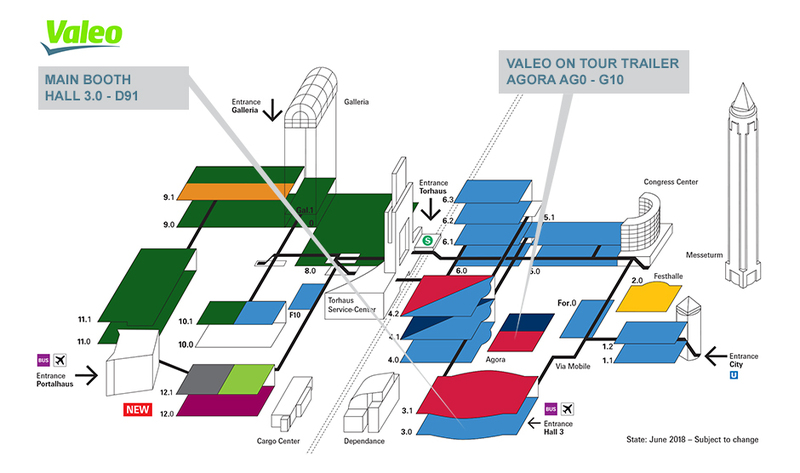 Valeo products and services are developed to help make drivers', workshops' and distributors' lives easier. Our Cyber Valet Services and the new aftermarket parking solutions focus on making the driver's life easier. Providing fully kitted solutions such as Valeo FullPACK™ DMF, Valeo KIT4P™, Valeo offers easy to find and competitive solutions for workshops and distributors. Improving driving comfort is at the center of Valeo's strategy both in Original Equipment and Aftermarket. We're committed to protecting driver and passenger health and safety inside the car cabin, while ensuring better comfort through smart driving and parking solutions.